As dedicated Naim Audio retailers, we sell the full range. 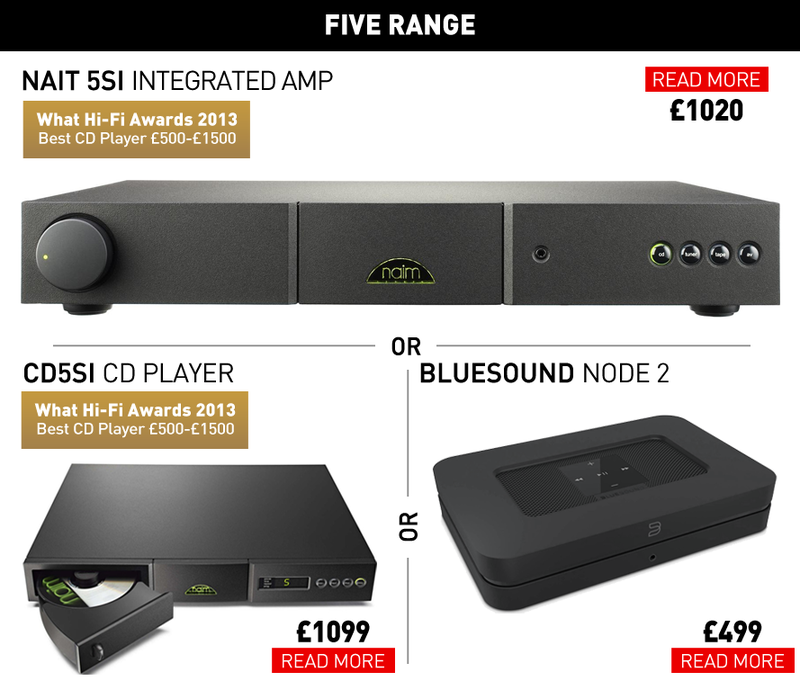 This spans from the one box systems (Mu-So range), Uniti range (hi-fi system in a single box), Five range (introduction to hi-fi separates), XS range (full hi-fi separates system), Classic range (higher range of hi-fi separates), and 500 range (flagship hi-fi separates, with the only higher product available being the Naim Statement amplifiers). We keep MOST of the Naim range in stock and available to listen to in our midlands showroom, making Audio Affair a single location where you can discover Naim and build a system that suits your requirements and budget, with the help of our expert and friendly staff. We can also offer 0% finance on orders over £500 (over 6-48 months depending on spend), allowing you to spread the cost of your investment in listening. When the original Naim Mu-So (the larger one above) was released it was a huge move for the brand, having traditionally focused on hi-fi separates to release a competitor to the finest "single box" speaker systems under £1000 - akin to Bentley suddenly releasing a competitor to the 3 series! Expectations were high and the Mu-So certainly didn't disappoint, with its battleship build quality, impressive sound quality and iconic design, its a fantastic music system that can play music streamed from Bluetooth devices and more. 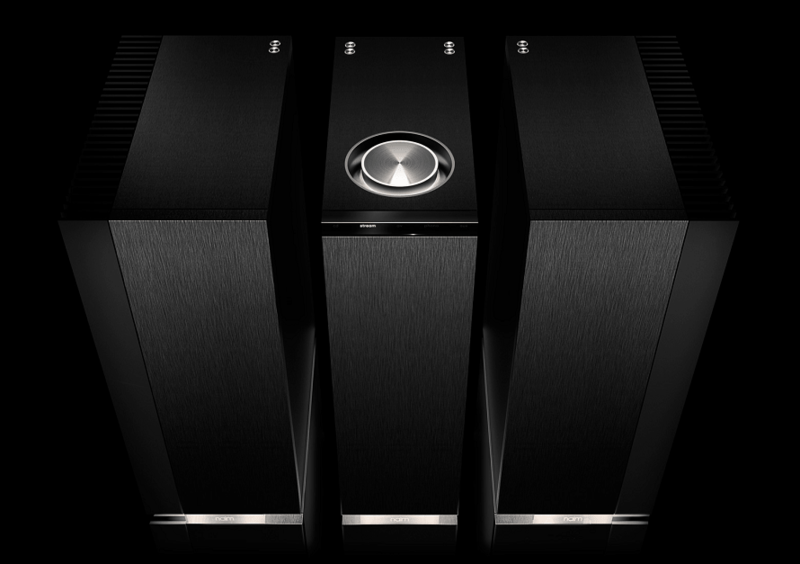 In 2016, Naim announced the Mu-So Qb (the smaller one above), a more compact version of Mu-So. You can also link these together as a multi room set-up with other Mu-So's and Mu-So Qb's. Both systems have optional coloured grilles available separately. 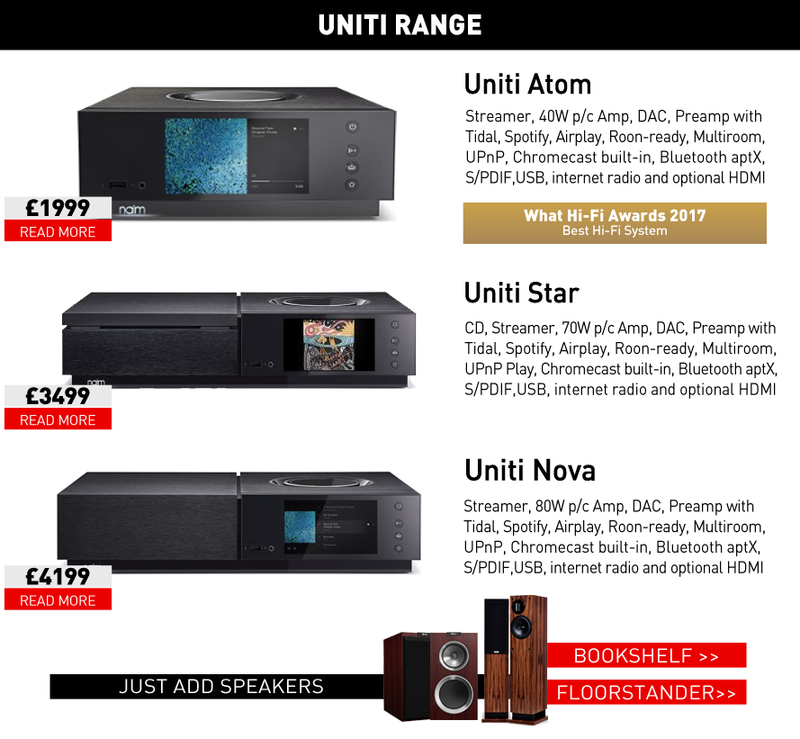 While Mu-So sounds fantastic, Naim's most popular products are is Uniti range (below). Each of these is designed to give hi-fi separates sound quality from a single box with a choice of four models. Uniti range came out several years before Mu-So but were also a huge move for Naim as single box "all in one" hi-fi models were never previously viewed as a serious alternative to a full hi-fi system, and while the Uniti range will never sound as good as a full separates Naim XS or Classic system with all the bells and whistles, the Uniti range was an incredible achievement by Naim and we havent heard any other one box systems that sound as good as Uniti (and we audition a lot of brands). 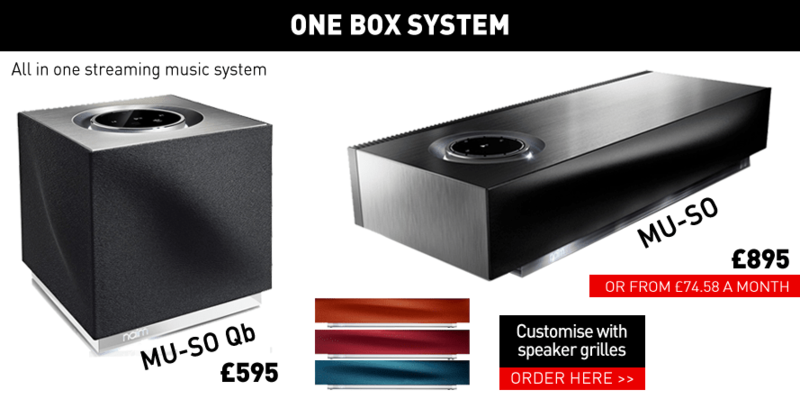 Each of these offers hi-fi separates quality from a compact, space saving single box - you just need to add speakers (and we can offer advice on this too). Need speaker matching advice? Please call 0121 224 7300/7401 or e-mail us and we'll be happy to offer you advice, with the benefit of 0% finance options, part exchanges (if necessary) and our 30 day money back guarantee. 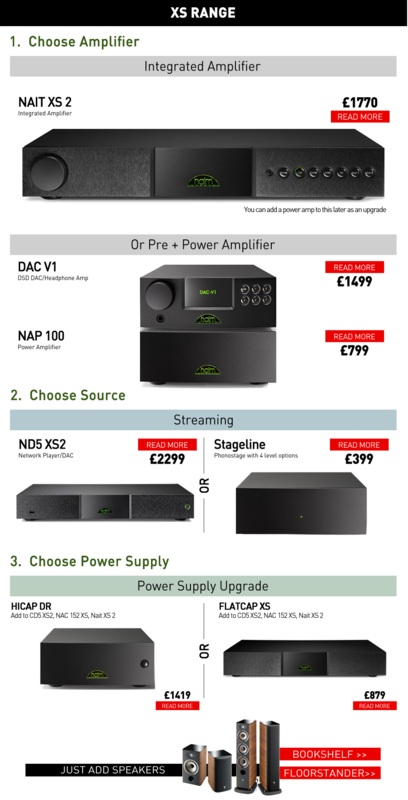 Classic range, believe it or not, is the most popular level of product we sell from Naim, a high end range of products that better the XS range, yet come in at more attainable prices than the 500 range. Just like XS range, you have the option of aspirational pre/power amplifier combinations (including Naim's latest version of the hugely iconic NAP 250 power amplifier and the option of the combined pre/streaming NAC-N 272, our best selling pre/power combination) or integrated amplifier (again, which can be upgraded by adding a power amplifier in future, although we find most customers who buy this integrated have a specific reason such as lack of space but still want very high level separates). Music sources include streamers, combined CD ripping/storage (Uniti Serve models), CD, phono stage for a vinyl turntable (we recommend matching a Linn LP12 turntable with Naim), along with optional DAC and power supplies as further upgrades for specific models. 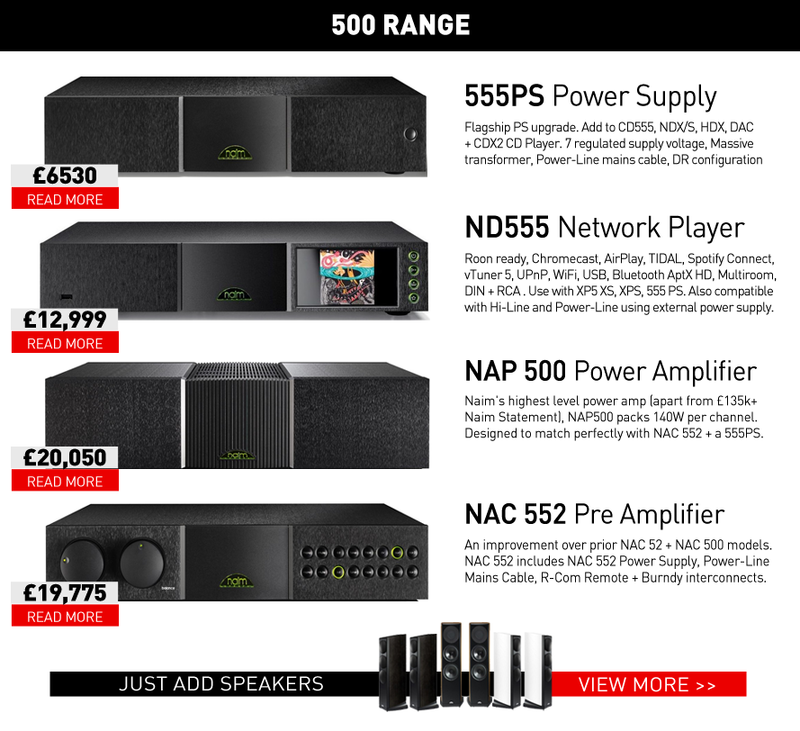 The flagship Naim products are contained in the 500 range. This range contains only 5 products, a very high end pre/power amplifier combination (only bettered by the Naim Statement amplifiers at over £125k, but still incredible and more attainable at a third of the price), with the option of either a flagship streamer or flagship CD player and a matching power supply upgrsade. Its worth noting that the 555PS below can also be added to some Classic level products as the ultimate power supply upgrade over an XPS or Supercap. 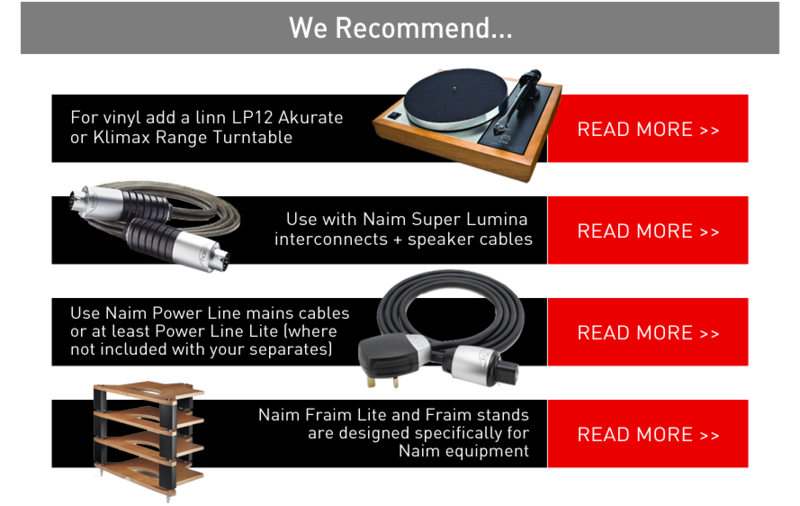 We hope this quick guide to the Naim range has been helpful (remember you can click any of the items above to read more), but the real guide to Naim is offered by our expert staff and that's exactly what we're here for - to offer friendly and helpful advice. Whether you're spending £595 on a Naim Mu-So Qb or over £10,000 on a Naim Classic system with matching speakers, we're here to help you find the system that's right for your budget and favoured music sources. We can guide you through the options and you can listen to a range of products from the Five range, XS range and Classic range in our showroom with little notice. To discover Naim Audio properly, contact us to arrange a listen in our midlands showroom. Alternatively, if you already have an idea of what you want and need a little further advice or want to discuss 0% finance options, please call us on 0121 224 7300/7401 or send us an e-mail with your phone number and query for a call back.